Thirty years ago Greg was driving an Oldsmobile Toronado when he married his wife. 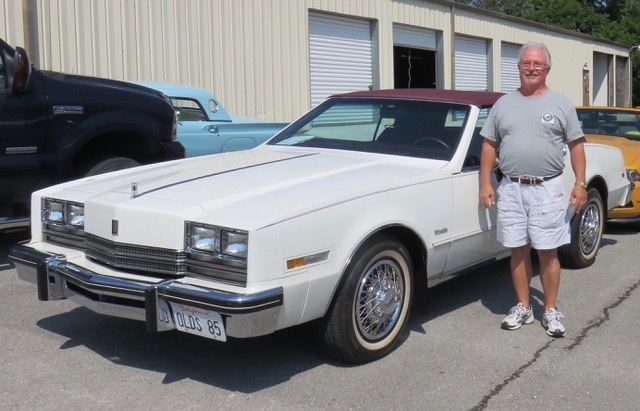 While that car is no longer with him, when Greg saw this 1985 Toronado apppear for sale on eBay with only 23,000 miles he knew he wanted it. After a bidding war and paying full price for the car, he became the new owner. The car was located in Palm Springs, California. Greg had existing travel plans and thus only had a week to get the car home after winning the auction. With no luck finding a carrier that could pick up the car in time, Greg decided to drive the car home himself. Within an hour of landing, he was behind the wheel headed for home, only stopping for fuel, food, and sleep. Since purchase the car has been in two Oldsmobile national shows, taking home a first place trophy in one of those shows!